I remember being a kid and wanting to be an author when I grew up. I loved having notebooks full of writing and ideas, colorful pens and pencils sharpened and ready to flow, and the freedom to develop whatever world I felt like creating. When I was writing I was the most powerful person in the world. I want my kids to enjoy writing like I always had. Writing is a creative process, even when it comes to writing business proposals. Maybe they aren’t the most exciting documents, but being able to craft a well-written document is certainly creative. I also know that I don’t want writing to be just another chore in their lives. I want them to feel the same excitement I did. We decided to give WriteShop Junior a try for Royal and Baloo. They are loosely 3rd and 6th grade so I felt they could both work on the same curriculum. We try to combine as much work as possible because it saves us so much time. They all get more done and we aren’t scrambling to finish everything. 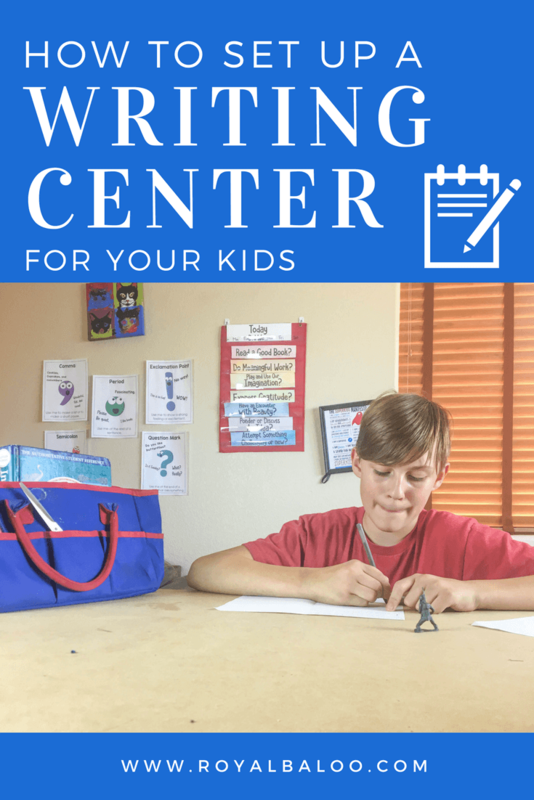 I wanted to set up a writing center at home before we started. My hope was that we could have a place where they could feel inspired to write and have all the tools available at their fingers. I know that kids will feel inspired by the space around them so why not give them a space that is extremely inspiring? Here are the steps I took to create our writing space. Find a place for all the writing you’ll do. The location is fairly important as it should be motivating and inspirational. This might mean having a great selection of books nearby, an open window with a view, motivational quotes on the walls, or punctuation posters hanging. It might be a quiet area with decent lighting and a flat surface. Use what inspires you and hopefully your kids will feel inspired by it as well. Get great tool storage – depending on your dedicated place, you might need portable storage or you might be able to get away with permanent storage. 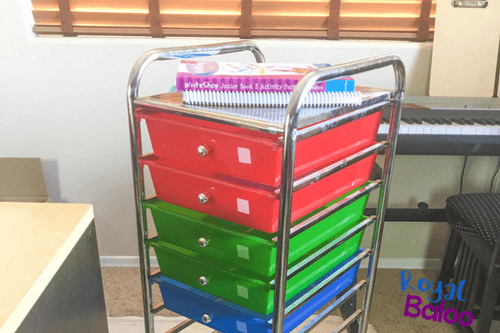 Get an organizer, a rolling cart, shelves, or any type of storage that suits you. We have a rolling cart for most of the tools but I also have an organizational bag that could be used to take our writing on the go. Fill it up with great tools – Crayons, markers, pencils, pens. Include fun pens, like gel pens, as well. Paper – all kinds! Ruled, blank, construction, etc. Scissors, index cards, paper clips, and other general office supplies. Take your time and gather a collection of quality materials. Add posters or reference tools – there are many poster options for reminders about things like punctuation, grammar, and style. Consider adding one or two that would be useful. Also, make sure to have a dictionary and thesaurus available. Add in fun office supplies. There’s nothing like perusing the aisles of Office Depot, right? Post it notes of every size, shape, and color. Sharpies in every shade. All the office tools that you never really use but think you should have on hand. Collect a few of those fun items to store in your space. Only buy the ones that would actually be useful, though. Provide tools for Brainstorming. A whiteboard and dry erase markers, post-it notes, inexpensive paper (like print on a roll). And also tools for editing. White out, highlighters, more post-it notes. And finally, add some DIY Book tools. What I mean by this: tools that could be used to “publish” their works. Cardstock, white paper, and a stapler could turn into a book. Construction paper, scissors, manila folders, glue, tape, etc. You can even purchase books ready to write in from Amazon. I’ve found a lot of benefits to having the writing space all set up and ready. First, my kids are more likely to sit and write on their own when they feel inspired. The space just looks inviting and the fun tools are almost mesmerizing. I even want to sit down and write there sometimes. Second, it makes our writing lessons so much easier having the materials all ready for us. I like to review our homeschool plans every Sunday before we start the week to make sure we have everything. All I have to do for writing lessons with WriteShop is review what we are working on. The program is essentially open-and-go when you have a writing space prepared. Third, having an area specifically for writing means I can have one kid working independently, while the others are doing what they need to get done. My kids love being together and learning together. Having said that, they also love to distract each other. This space helps prevent them distracting each other. Interested in checking out WriteShop? They offer samples and a free gift! Make sure to check them out to see if the curriculum will be a good fit for you. Get a Sample of the WriteShop Writing curriculum here. WriteShop is also offering a free gift! Journal All Year! Writing Prompt Calendar Bundle.